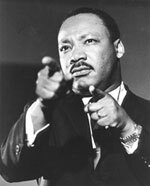 The Radical Words of Martin Luther King Jr.
Last week I talked a bit about Martin Luther King Jr. being a radical. Today it seems appropriate to look at some of his radical words. Man’s proneness to engage in war is still a fact, but wisdom born of experience should tell us that war is obsolete.